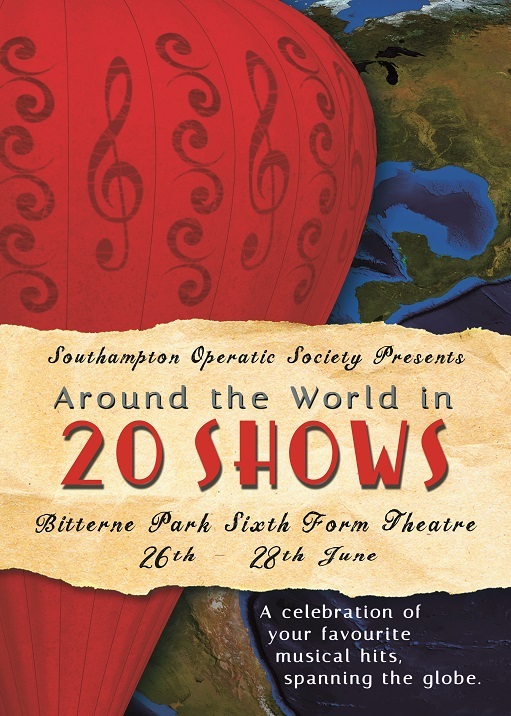 Whilst the three main musical groups based in Southampton performed at the Mayflower Theatre, there was an understanding that SOS would only present operas and operettas leaving the field of musicals to Southampton Musical Society and Southern Theatre Productions. However, once it became a big financial risk to hire that theatre, the Committee thought that the group could no longer restrict itself to such a narrow field (especially when performing two main shows a year) and it was decided that musicals would now become part of the repertoire. 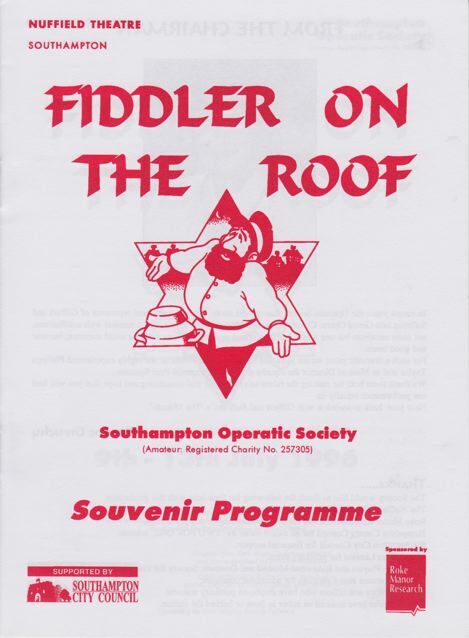 Admittedly, they did have 72 years to select something suitable but Fiddler on the Roof was an inspired choice as it had a serious side that is missing from many of its ‘frothier’ counterparts. Philippa Taylor, an ex-member who was very active with The Maskers, was invited to direct the show and Paul Spanton was a popular choice as MD. For a change the members responded in good numbers for a summer show and it opened with 47 inhabitants of Anatevka on stage singing Tradition. Although the grand Act 1 Finale, which is a feature of G&S, was missing and the part singing was less demanding than usual, the company enjoyed rehearsals and the music was good. There were also many more minor principal roles available than usual and even opportunities for some to come forward and play the various cameos on offer (beggar, book keeper, man who sold a mule, etc.). One person who definitely rose to the occasion was Business Manager, David Rayner. Not satisfied with sending the Fiddler (Esther Pallot) to play on the roof of Notebane House for extra publicity, he then convinced the Echo that three chickens (which were supposedly to be used as gifts in the wedding scene) had been eaten by a fox - that led to a photo shoot with a distressed Philip de Grouchy (Lazar Wolf) looking glum as he held an empty cage. The fabricated story even made page 3 of The Sun! There were some fine performances from a strong principal line up, but the show was memorable due to the fine portrayals of Golde (Pam de Grouchy) and Tevye (David Jupp) - the latter in a role that fitted like a glove! Indeed, the Echo reported, ‘David Jupp, who played the lead as milkman, Tevye, gave an excellent virtuoso performance that lifted the production to new heights for the operatic society.’ High praise indeed, but it was thoroughly deserved. Fiddler on the Roof also made a pleasing profit of £910 and, furthermore, no chickens were actually harmed in the making of this show!